Petersen Rock Garden is one of those roadside attractions that defies description. You’ve just got to visit, and you’ll be glad you did. The garden started in 1935 as the pet project of Danish immigrant Rasmus Petersen. 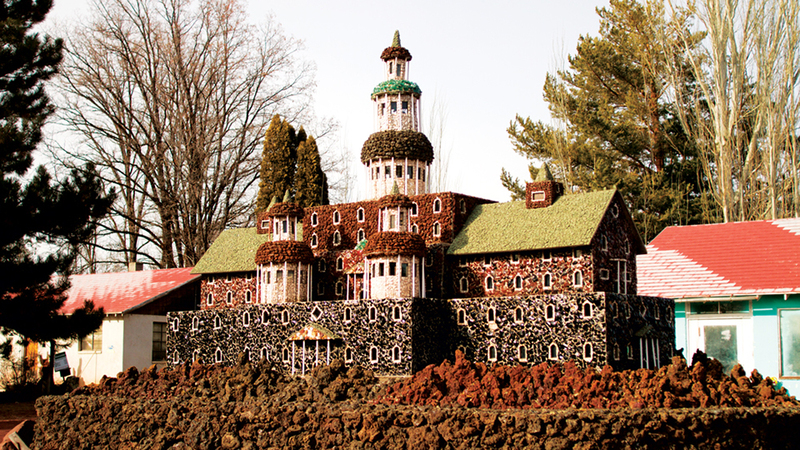 Petersen settled on a large piece of land off Highway 97 between Bend and Redmond and set about creating castles with moats, fountains, towers, bridges, even miniature models of famous buildings like the Statue of Liberty, all built from rocks, shells, bits of glass, and other found objects. Gravel pathways meander around the property, inviting visitors to see what curiosity will await them around the next bend. And for decades, each monument to Petersen’s imagination has delighted the young and young at heart. Petersen Rock Garden, which is listed on the National Register of Historic Places, also maintains a gift shop and a rock museum, where visitors can explore rare geodes, agates, fossils, and more. Admission is a suggested donation, and the garden is open daily from 9:00 a.m.-7:00 p.m.